Speculation’s swirling about Facebook’s IPO–from what went wrong to who’s to blame. Here’s our guide to what matters to you. 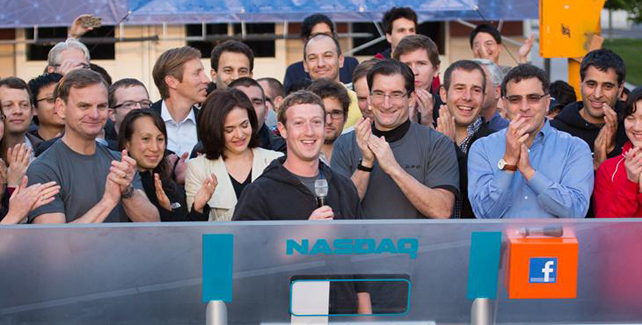 It’s true: We, like many others, were all over the Facebook IPO. Which is why when Facebook’s stock tumbled from $42 to $31 in less than a week after it began trading, we started looking for explanations. So did everyone else–from investors, to analysts, to the SEC to more pundits than anyone could count. What is clear is that Facebook and its underwriters fumbled several aspects of the IPO. What’s still unclear to even the loudest pontificators is what all this will mean for the way Wall Street and Facebook do business in the future. Even more importantly, how could it all matter to you? Here’s a timeline to help you navigate the news. The Blame Game: What Happened? What Happened: Facebook executives, including CEO Mark Zuckerberg, kick off the road show, a series of presentations a company makes in front of potential investors in order to stoke high desire for its stock. If Facebook were an ad agency, the road show would be the all-important client pitch. 1. Join a class action lawsuit. The lawsuits have already started pouring in against Facebook, Morgan Stanley, Nasdaq, individual executives, and anyone else who could reasonably be on the other end of a hostilely pointed finger. The shareholder claimants are pretty much arguing the same thing: Neither Facebook nor the underwriters told us–the 99% of Facebook stockholders–its revenue estimates had changed, and now we want justice. And probably money. Occupy Facebook. The problem is, it’s still unclear whether or not Facebook was legally obligated to be any clearer when it made that original revision to its S-1. Most everyone would agree that, from an ethical standpoint, Facebook should have made sure the entire market was told what, if anything, it privately told its analysts (that probably would have saved Facebook PR a lot of headaches.) But legally speaking, that private information has to be deemed “material” in order for it to matter in a court of law. Unfortunately, no existing law clearly outlines what information is material and what isn’t. 2. Wait for the government to do the legwork, then maybe join a lawsuit. Just about everyone wants to know the real story behind what went wrong, but the people best equipped to find out are, naturally, government officials. Which is why it’s convenient that everyone from the SEC to the Commonwealth of Massachusetts to congressional panels are launching their own “reviews” of what happened. Wait for the shakeout from the investigations, see if anything will help you make a case for why you were wronged, and take those government-sanctioned facts to a lawyer. 3. Sit on your 1 or 5,000 shares of Facebook stock and wait for the market to turn around. A value investor sees stocks as long-term investments, not as an opportunity for short-term payouts that may or may not pan out. (For some bitter, but effective medicine, read Joe Nocera’s Op-ed in the New York Times.) A lot of amateur investors miss the real point of an IPO, which is to benefit the company, first and foremost. In that respect, Facebook did exactly what it was aimed to do: make a lot of people very rich. Never mind that you didn’t happen to be one of them. What Happened: A Facebook executive reportedly tells analysts at the four major banks overseeing the deal that the company isn’t going to make as much money this quarter as they originally thought. The analysts–at Morgan Stanley, J.P. Morgan, Goldman Sachs, and Bank of America–simultaneously lower their revenue estimates to reflect the new information, but keep that information mostly to themselves. What Happened: On the third day of the road show, Facebook makes a revision to its S-1, a document all public companies need to file with the federal Securities and Exchange Commission before they are allowed to start trading. The new section says that an increasing number of people are using Facebook on mobile devices, and vaguely implies the shift could impact how much money Facebook can make on ads. The revision offers no numbers or further detail. What Happened: Morgan Stanley, J.P. Morgan, Goldman Sachs, and Bank of America–the four underwriters in charge of handling the Facebook deal–reportedly reveal to a few large, “preferred” investors that Facebook is not going to make as much money as they originally thought, based on analysts’ new estimates. Smaller investors, including ordinary mom-and-pop buyers, aren’t informed. What Happened: Investment firm Capital Research Management meets with Facebook and underwriters during the roadshow, after which the firm slashes the number of shares it intends to buy. What Happened: Two days before Facebook goes public, a group of existing Facebook shareholders announce they’re selling an additional 83.8 million shares on opening day. Typically, a company limits how much stock smaller investors can buy, because bigger investors want as much as they can get. But Facebook decides to increase the number of shares mom-and-pop investors can buy, from 500 to 5,000. What Happened: Facebook announces it will offer its stock for $38 a share, much higher than its originally planned offering price ($28 to $35). Normally, this is good news–it means the people in charge of pricing a stock feel they are accurately judging the level of demand. At this point, certain investors know that $38 is a little high, because they were told that Facebook isn’t making as much revenue as it previously said. But the smaller investors–the same ones who just ordered larger amounts of stock as it came available–are left in the dark. What Happened: After a half-hour delay due to technical glitches with the Nasdaq’s computer system, Facebook officially becomes a public company when its stock begins trading at $42.05. Investors who are clued into Facebook’s new financial situation are in a position to quickly sell off their shares at $42 each and make no new purchases. However, the day takes a sharp turn, and the stock closes at $38.23. Smaller investors and the general public are left confused as to why the stock dropped so quickly. What Happened: Facebook’s stock price continues to fall over the next few trading days. Smaller investors who had originally bought stock on opening day for $42 now find themselves sitting on shares that are only worth around $31. (If you had bought 5,000 shares for $42, you would have lost $55,000.) News reports begin to trickle in about what happened between Facebook, its underwriters, and certain investors and analysts in the weeks leading up to May 18. The government gets involved as the SEC, the Financial Industry Regulatory Authority, the Commonwealth of Massachusetts, and two congressional panels all announce they will review what happened. What Happened: Sources report four of Wall Street’s largest market makers–UBS AG, Knight Capital Group, Citadel Securities, and Citigroup’s Automated Trading Desk–expect total losses from Nasdaq’s opening day glitches to total around $115 million. Market makers are firms that stand ready to buy and sell a particular stock at a publicly quoted price. What Happened: Facebook shares dip below $30. This page will be continually updated as new information becomes available.